Zhao Baisheng is Chair of the Institute of World Literature and Secretary General for the Cross-Cultural Studies at the University of Peking. His publications include Theory of Auto/Biography (2003). 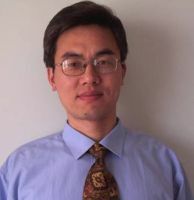 From 24 June to 30 July, Professor Zhao Baisheng was guest professor of the Center for Intercultural Studies at Mainz. He was affiliated with the new Department of English and Linguistics (Seminar für Englische Philologie and Institut für Allgemeine und Vergleichende Sprachwissenschaft) and offered a seminar and a series of lectures. This seminar explored the complex mechanism of the East-West border crossing and its cultural conse-quences. Such processes and movements as immigration, colonization, Westernization, Marxianization, globalization were examined to demonstrate the ongoing shaping of a World Literature and Culture. The core texts included fictional works and life writings by Daniel Defoe, T. S. Eliot, Hu Shi, Patrick White, V. S. Naipaul, J. M. Coetzee, Maxine Hong Kingston.